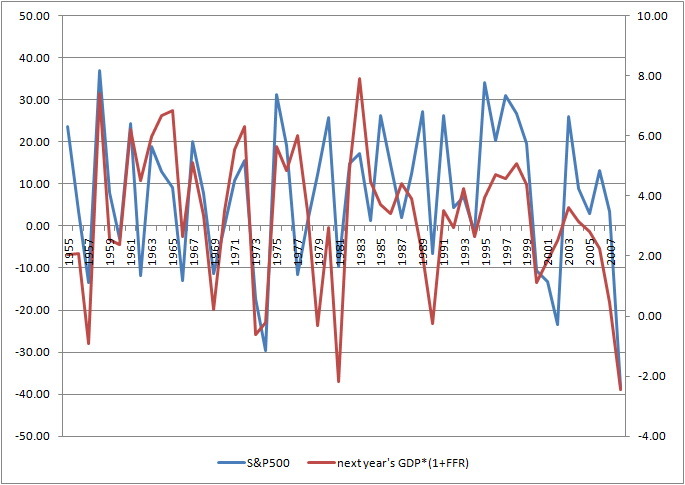 As I've written in my previous post, there was not any straightforward correlation between annual S&P500 returns and GDP nor FFR. However, when you compare one year's market return to the product of the next year's GDP and FFR (actually 1+FFR), the correlation jumps to 0.61. 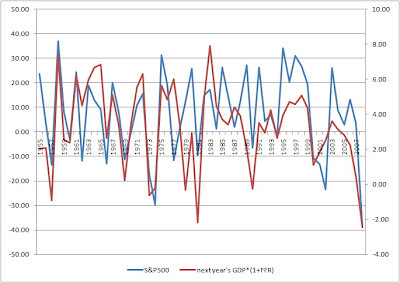 GDP*(1+FFR) can be interpreted as the sum of the economic growth and risk free rate in a given time. Nevertheless, due to high volatility, even that market predictions of the future economy state were pretty good, returns produced by the market were only marginally better than the risk free rates as expressed by FFR. Where is the risk premium II? The fall of a country called BP?